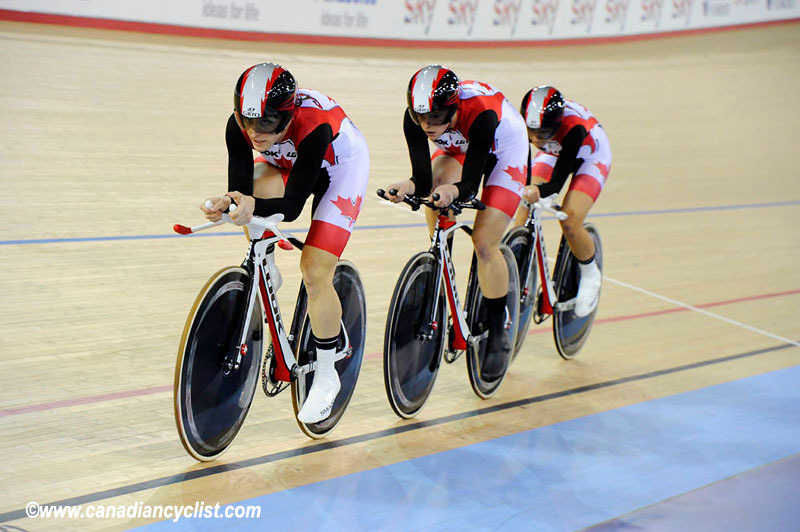 Canada got off to a great start at the final round of the World Cup, in London on the new Olympic track, when the women's Team Pursuit squad of Tara Whitten, Jasmin Glaesser and Gillian Carleton came within 1.216 seconds of beating the World Record during qualifying. Great Britain, racing before a partisan crowd that raised the roof during their ride, finished 0.585 seconds behind Canada, and the two teams will fight for the gold medal tomorrow evening, when a new world record will likely be set. Australia and the Netherlands will battle for bronze. Great Britain started out fast, setting the fastest opening 1000 metres in the 3000 metre race, while Canada (only third fastest in the opening 1000 metres) steadily built their speed through the race, recording the fastest splits for both the second and third 1000 metre segments. We asked Tara whether the team backed off slightly in the final half lap to 'save' a world title attempt until the medal round, she laughed and said "I couldn't have gone any harder, I was at my maximum." "We did have a set schedule that we wanted to try, but you can never really predict the conditions until you get out there. We did a really good job with the conditions we faced." Gillian Carleton, also a newcomer to the team in her second Team Pursuit, was extremely pleased with the ride, "It was a very exciting ride. I knew that our team was going really fast heading into this race. We raced the way we were capable. It’s really exciting to set the new Canadian record." "I would be very happy with this race as a stand-alone race. Our goal was to qualify, and move on to the medal round. Now that I see what we can do, on a track with conditions that weren’t as good as in training, I feel confident that that we have a chance to win the gold medal tomorrow, and put everything on the line again." Whitten: "It’s a beautiful track. Feels so good to ride, and have the atmosphere of the spectators in the stands. The rest of weekend will be crazy. It’s really loud out there, so it’s important to maintain your own bubble. There is a lot of energy, and we know it will just build over the next months." Glaesser: "It’s super exciting to ride in a country where cycling is held in such esteem. You can really tell that the passion is there, that the crowd is behind you. There is an appreciation for the sport, and it makes me feel really motivated to ride." Carleton: "Other than the physical characteristic of the track, what struck me most tonight was the crowd. You can tell that the people here are crazy about cycling. I could hear during the race the announcer amping the crowd, with every split that showed up on the time board, which I would normally never do. I just thought that was the most motivating thing to do. It’s very exciting to hear when you’re on pace for the World Record, but at the same time, it doesn’t register too much, because we’re still focused on the execution of the plan, and what we’re supposed to do. It’s still a great morale boost!" Our comments are that it is indeed a superb facility, which will set a new standard for world class tracks. 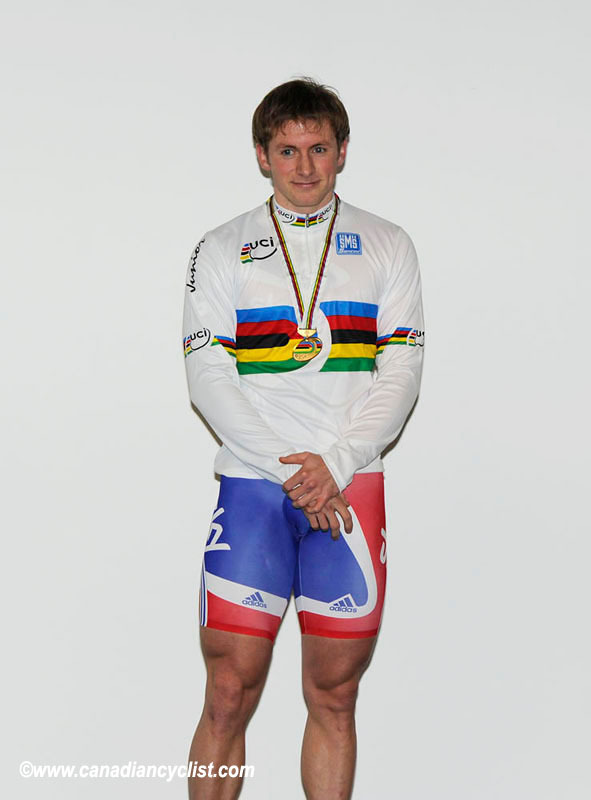 Prior to the start, in a small room under the track (and with little fanfare), a brief ceremony was held to award the 2011 Rainbow jerseys and gold medals to Jason Kenny of Great Britain for the men's Sprint and Germany for the men's Team Sprint. Both were awarded the titles after Gregory Bauge of France was disqualified for missing doping controls (see Daily News January 16), losing the individual Sprint title, and the team losing the Team Sprint title.